Driving through a winter wonderland. Image courtesy of Cameron Cesa. There are multiple dimensions to rock climbing that capture my continued attention of the sport: physical, social, and psychological. Physical, which is fairly self-explanatory; social, because it helps to have people cheering me on and encouraging me; and psychological, because I am continually forced to overcome the fear of falling in such a way that would require a hospital visit. Upon arrival to my first destination, I met some kids who couldn't have been any older than fourteen. They both out-climbed me. This was certainly a humbling experience. The next spot I went to was almost entirely void of rock climbers. After overcoming my fear of slipping on a foothold, hitting my face on a rock—all the while pulling myself over its edge—I finished a challenging climb, climbed back down, and sat on my crash pad to overlook the Deschutes River as it flowed through the fir and pine trees. In my experience, there is always peace on the other side of fear. I was glad I didn't give into my fear of seriously hurting myself. I wandered the rocks a bit more before calling it a day and heading back home. The call of the midterm I had to do for my Environmental Ethics course had gotten the best of me. Overlooking the Deschutes River. Image courtesy of Cameron Cesa. Upon return to Salem, I quickly and reluctantly mustered up the energy to get started on my Environmental Ethics midterm of which I couldn't shake the stress. I looked at the assignment. It was due the following Wednesday. "I could have stayed overnight! ", I exclaimed to my roommate. I was tempted to pack up my camping gear and drive back out to Bend, but instead I thought, "Oh well, I'll just go to the Rock Boxx tomorrow." Even though I wouldn't be under the hypnosis of the stars at the climbing gym, I knew I'd be surrounded by people who share the same love, passion, and appreciation for the outdoors. Getting outside does not mean procrastination. 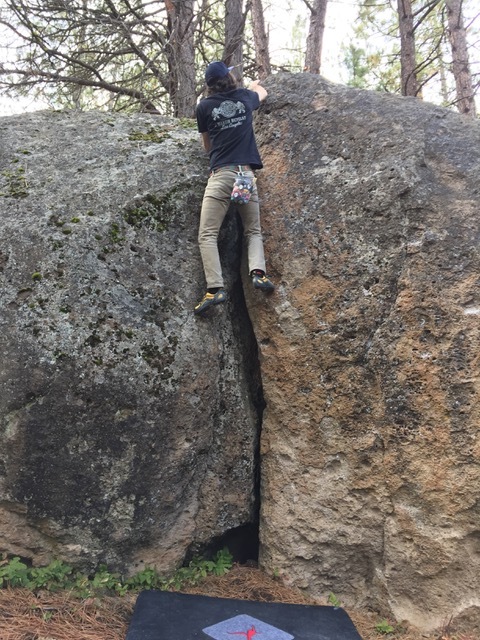 My bouldering trip to Bend left me feeling empowered and joyful. Everything seemed brighter and happier. I felt that there was no barrier between me and the outside world, which is hard to escape when working vigorously between the confines of four walls of a library. I felt transparent. I felt free. This is what getting outside does for me. It brings me closer to that pure, light-hearted feeling that seems almost as fleeting as the sunshine in Oregon. At the Rock Boxx that night, I was happy to see familiar faces. I climbed incredibly well, in large part because I felt the positive energy and encouragement from my fellow climbers and because I had spent the day prior outside. Getting outside and engaging with a like-minded community never ceases to inspire awe and wonder in me. Nearing the edge. Image courtesy of Cameron Cesa. Cameron Cesa is currently a senior at Willamette University, studying Environmental Science (Social Science Emphasis). Cameron grew up in Los Angeles, where his mother teaches Psychology and Cognitive Neuroscience at USC. He has an Australian passport thanks to his father, who is an Australian citizen currently living in Melbourne. Cameron plans on spending a significant part of his life in Australia as well! Also, thanks to his parents, Cameron was repeatedly exposed to awe-inspiring nature experiences as a child, in places such as Joshua Tree National Park and Sequoia National Park. He's always loved to fish for trout, whether with a fly or a spinner, and has always felt most himself when basking in the sun next to a mellow mountain stream. Cameron has found a new passion in bouldering and rock climbing because he is consistently challenged and forced to think outside of what he perceives to be the realm of possibility when "on the rock". The most memorable outdoor experiences Cameron has had have been weekend fishing trips to the High Sierras in California with his father, and the camaraderie and connections formed within the climbing community in popular rock-climbing areas. Cameron is completing his academic year internship with the Straub Environmental Center.